By utilizing an electronic document-management system, healthcare organizations can increase their chances of maintaining data integrity standards. In the scramble to implement EMRs and qualify for incentive funds under the American Recovery and Reinvestment Act (ARRA), many hospitals may overlook one important question: What about the paper? Yes, you read correctly. The word “paper” isn’t a typo. Experts say even when a medical record is fully electronic, paper documents (eg, handwritten notes, hard-copy information, documents generated from external organizations) will invariably still exist. How will hospitals handle this paper and incorporate it into an EMR? The answer lies within the sophisticated—and sometimes misunderstood—functionality of an electronic document management system (EDMS). An EDMS is a computer system (or set of computer programs) that includes technologies for capturing paper-based documents as scanned images. It then assigns metadata to those images and creates taxonomies to index them. An EDMS also includes technologies for receiving and storing digital documents such as computer output laser disk (COLD) documents (eg, lab results, transcribed reports, electrocardiograms [EKGs]) generated by other internal computer systems. The result is a complete electronic legal health record that can be used for long-term episodic archival purposes. Many people confuse an EDMS with imaging/scanning functionality, says Darice Grzybowski, MA, RHIA, FAHIMA, president of HIMentors, LLC and a former HIM director turned industry and informatics specialist whose consulting work focuses on EMR and EDMS deployment. “With scanning and imaging, you’re just capturing images that you can retrieve. With EDMS, there are workflow functionalities, sophisticated reporting, work queuing, and the ability to manage documents in a logic-based fashion,” she says. Consequently, scanning is just one component of an EDMS, says Deborah Kohn, MPH, RHIA, FACHE, CPHIMS, FHIMSS. Kohn, a principal with Dak Systems Consulting in San Mateo, Calif., previously worked as an HIM director before migrating to information systems and specializing in content management. Like Grzybowski, her consulting work focuses on helping hospitals deploy an EDMS. Kohn says she remembers several decades ago when scanning was the only option for hospitals that wanted to create electronic documents, as sophisticated EDMS technologies did not yet exist. She recalls installing one of the first hospital scanning/imaging systems in the United States in the late 1980s. “All we accomplished by scanning those documents was getting rid of the paper as an expensive alternative to microfilm,” she says. Today, however, it’s quite a different story. Vendors often claim they specialize in EDMS solutions that go beyond the basic scanning/imaging capabilities, but that isn’t always true, says Grzybowski, adding that there are only a handful of vendors in the market truly offering an HIM EDMS. The research firm KLAS published a report in October 2009, “Enterprise DMI: Finding the Right Stepping-Stone to Full EMR,” that can help hospitals choose from more than 30 vendors offering EDMS solutions. The findings, which can be viewed at http://tiny.cc/z8r6l, detail EDMS client satisfaction and functionality comparisons. KLAS is an independently owned and operated organization that helps healthcare providers make informed technology decisions by analyzing vendor performance. Distinguishing between an EDMS and a strictly scanning/imaging system is important, says Grzybowski. 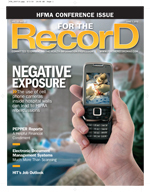 Although some EMR vendors offer an imaging/scanning add-on, it may not be a true EDMS solution. She says approximately one third of her clients rush into deploying an EMR that includes scanning/imaging capabilities without realizing it won’t give them the sophisticated workflow or other document-management capabilities they seek. “Hospitals that do not implement a true EDMS often realize after the fact that their costs continue to escalate, labor is not decreasing as expected, and physicians are dissatisfied with fragmented solutions,” she says. Many hospitals are beginning to realize the need for a true EDMS solution in addition to a robust EMR, says Grzybowski. “There’s starting to be a recognition that you need both. You need to have an electronic document-management system for your legal health record, and you need these patient-centric EMR applications for charting while the patient is in-house,” she notes. Experts say the question isn’t so much whether to deploy an EDMS as much as it is when to deploy it. Should hospitals roll it out earlier in the EMR process, during the later stages, or somewhere in the middle? The answer to this question depends largely on a variety of hospital-specific factors, says Edna Boone, MA, CPHIMS, senior director of healthcare information systems at HIMSS. HIMSS recommends earlier EDMS adoption and places the technology in stage 2 of its EMR Adoption Model. The model (available at www.himssanalytics.org) identifies and scores hospitals using an eight-step scale that measures progress toward a fully paperless environment. Hospitals in stage 2 also have a clinical data repository, controlled medical vocabulary, clinical decision support, and health information exchange capability. Nearly 51% of hospitals have moved beyond stage 2 to stage 3, which requires electronic nursing/clinical documentation flow sheets, a clinical decision-support system (error checking), and a picture archiving and communication system outside of radiology. This percentage is up from nearly 36% in 2008. The HIMSS Analytics Database reveals that 59% of hospitals used document imaging technology in 2009, while 41% of hospitals used electronic forms-management technology. Deploying an EDMS early in the EMR adoption process has many advantages, one of which is that it familiarizes clinicians with accessing data via an electronic medium, says Boone. “Getting key pieces of electronic data accessible to clinicians can be seen as a very quick and easy win. It’s really the first step in adoption,” she notes. Early EDMS implementation allows hospitals to create a virtual container into which all electronic documents can be fed as the EMR is rolled out, says Grzybowski. “You’re building a place to store it all. If a hospital doesn’t have an EDMS, it starts generating bits and pieces of medical record documentation that need to be printed and stored,” she adds. Another advantage of early deployment is that it prevents hospitals from having to back-scan paper documents that would have continued to accumulate over time had they waited to implement EDMS after or during the later stages of the EMR, says Sandra Nunn, MA, RHIA, CHP, a consultant with Melinunn Consulting in Albuquerque, N.M. “You don’t have to go backward and scan information from years ago because you’ve already got it,” she explains. Like Kohn and Grzybowski, Nunn previously worked as an HIM director before transitioning to content management, which remains the focus of her consulting work. Early implementation also allows hospitals to reap the rewards associated with an EDMS sooner, says Grzybowski. For example, after scanning images, an EDMS allows HIM staff members to easily cross-index searchable fields (eg, ICD-9-CM diagnosis and procedure codes) and route information to certain requesters who seek particular code combinations. These requesters may be outside the HIM department. For example, the pharmacy department may want to study all adverse medication effects. With an EDMS, the cache of applicable records can be queued, and the requesting department is notified of the pending review, says Grzybowski. Another advantage of early adoption is that hospitals can implement stronger security precautions, says Grzybowski, noting that an EDMS assists with security and release of information by providing singular, unified access to all documents within an episode of care. There are, however, disadvantages to deploying an EDMS early in the EMR rollout process. One is that some clinicians may simply want to stop with an EDMS and proceed no further. They may incorrectly assume that just because the information is electronic, it’s a true EMR, says Boone. Hospitals may also become too dependent on the EDMS, says Kohn. “I have seen organizations that have had an EDMS and don’t necessarily want to cross the bridge to the EMR,” she adds. From an operational standpoint, deploying an EDMS may be easier if hospitals wait until the majority of the record is electronic, says Nunn. Once a record is mostly electronic, hospitals can more easily distinguish between information that is already digitized and what is still on paper. They can also more easily determine the amount of paper they will need to integrate into the EMR through the EDMS, she adds. Implementing the majority of the EMR first means a higher percentage of documents will already be electronic, which reduces the burden on the HIM department because HIM staff members will have fewer documents to scan, Kohn says. One disadvantage to a later deployment is that hospitals will need to maintain paper records for a longer duration, which has many associated costs, says Boone. For example, there are human resource costs to file, retrieve, and maintain paper records as well as potential storage costs (both on site and off site) for those records. Although deploying an EDMS earlier in the process will involve significant up-front costs, ultimately the organization will reap long-term savings and avoid pricey storage and human resource fees, she says. Staying in a hybrid environment for a longer period of time can also challenge and frustrate clinicians and staff members, adds Kohn. What Documentation Should Be Electronic? • all EKG, telemetry, and monitor strips. In addition to COLD-feeding certain documents, forms should be bar coded or linked to index codes through optical-character recognition or speech recognition software or otherwise imported without having to manually index the documents, says Grzybowski. “Scanning and related processes are the most labor-intensive part of the EDM process, so the greater degree of electronic integration, the greater the success and the more cost-effective the EDMS solution will be,” she says. On the other hand, Grzybowski recommends hospitals wait to implement computerized physician order entry until after an EDMS has been deployed because the EDMS allows physicians to more easily sign off on orders. “An EDMS allows practitioners to go to one place to view and authenticate entries of an entire medical record, creating a positive workflow for the clinical staff and administrative staff,” she explains. • What are your organization’s priorities? In light of ICD-10, HIPAA 5010, ARRA, and more, hospitals need to consider the time, resources, and money they have to devote to each of these major projects, says Kohn, who anticipates many hospitals will simply put EDMS implementations on hold so they can scramble for ARRA funds. • What are your record storage and retrieval costs? Moving to an EDMS earlier in the process may help significantly reduce or even eliminate storage and retrieval costs, says Boone, noting that many hospitals don’t realize they may be spending $50 or more per square foot for paper storage on site. “You want to repurpose that storage space for clinical care that’s going to generate revenue and serve your patient needs,” she adds. • What parts of the record, if any, are already electronic? The bulk of the record tends to be nursing documentation, so if this is already electronic, this may be a good point at which to implement an EDMS, says Nunn. • What other departments could use the EDMS? An EDMS isn’t just for the HIM department, says Kohn. Other departments such as legal, contracts, and billing can also take advantage of the technology. If multiple document-generating departments support the use of an EDMS, the organization may be able to justify its purchase sooner rather than later, she adds. • What are your other HIM challenges? There are several HIM-related factors that may necessitate earlier EDMS adoption, says Grzybowski. For example, large numbers of medical record delinquencies, excessive loose reports, high volumes of chart retrieval, lack of space for physical records, and other rising costs within the department may be signs to proceed now with an EDMS implementation.